In trying to eradicate Texas Fever, it was evident that the pests could be attacked in two locations, on the pasture and on the cattle. After this farmers had two options of prevention, either totally exclude your cattle, horses, and mules from the pasture until the ticks died of starvation, or treat the cattle while on the infected pasture with certain medications like oils or other destructive agents directed towards the ticks. In many cases a basic crop rotation was used to ensure that the ticks would not infest the pasture while the cattle were to be grazed on that certain pasture. For example, if you removed your cattle from the pasture on July 1, your pasture would be free of ticks on March 1. Basically this program would starve the ticks and therefore, prevent the Texas Fever problem. Cattle ticks could be destroyed by using various "tickicides," such as oils, arsenic, etc. These were applied in three ways - by hand, by spray pumps, or by means of the dipping vat. Hand application was practicable only when a few animals were to be treated. Substances said to be of value in this method were a mixture of lard and kerosene, cottonseed oil, or a half-and-half mixture of cottonseed oil and kerosene, and finally, crude petroleum, which in general proved the most effective. However, it had some drawbacks, chief of which was the difficulty of obtaining oil of the proper quality, its expense, its bulk, which makes its transportation costly. There was also potential injury to cattle when the treatment was applied in hot weather. Any of these could be applied with a mop or a good sized paint brush, but unless great pains were taken this method of treatment was not thorough, and even at the best some portions of the body where ticks may be located were missed. Spraying was best suited for small-sized herds. The arsenic mixture or the crude petroleum or emulsions of the same were applied by means of an ordinary pail spraying. Cottonseed oil, or cottonseed oil and kerosene in a half-and-half mixture, or crude petroleum, may be used in these pumps, and a 20 percent mixture of any one of these killed most of the ticks. Dipping in a vat was the best and cheapest method of applying remedies when large herds were to be treated. many efforts were made to discover a practical method for dipping cattle to destroy ticks without injury to the cattle itself. The Bureau of Animal Industry finally prepared a solution that did just that. The recipe included 10 pounds of finely powdered white arsenic containing not less than 99 percent of arsenic trixoid, 25 pounds of sal soda, and 1 gallon of pine tar. The arsenic and sal soda were boiled together in not less than 25 gallons of water for 15 minutes, or longer if necessary to effect complete solution of the arsenic. Before the pine tar was added the temperature of the solution was reduced to 140 degrees F. This was done by the addition of cold water. The pine tar was then added in a small stream while the solution was thoroughly stirred, after which the solution was immediately diluted with clear water sufficient to make 500 gallons of dip. Cattle were always watered a short time before they were dipped. After they emerged from the dip vat they were kept on a draining floor until the dip ceased to run from their bodies; then they were placed in a yard free of vegetation until they were entirely dry. If cattle were allowed to drain in places where pools of dip collected, from which they might drink, or were turned at once on the pasture, where the dip will run from their bodies on the grass and other vegetation , serious losses were liable to result. 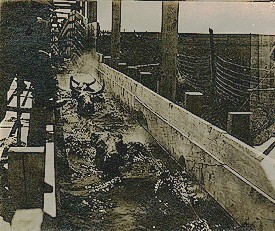 Crowding the animals before they dry was also avoided, and they could not be driven any considerable distance within a week after dipping, especially in hot weather. If many repeated treatments were needed the cattle could not be retreated within two weeks time to avoid severe losses. To view a larger image of a typical dipping vat click on the picture.